Another cute family for the National Charity Model Search! The Luber family. Wow, I’ve had a great time with them throughout the years. 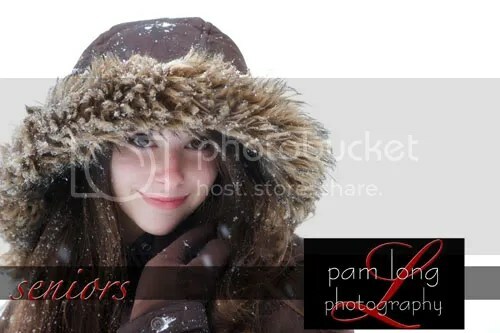 I could link you to at least a dozen posts on my blog that have them or one of their family members involved in a Pam Long Photography photo session. 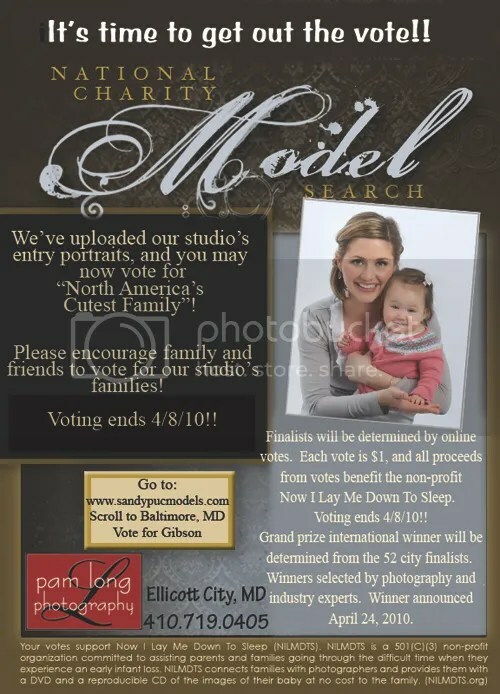 Last year, Steve and Mia’s oldest daughter won the National Charity Model Search for the cutest kiddo for Maryland! Part of the prize that the state winner receives is a photo session by world renowned photographer, Sandy Puc. Sandy coordinates this contest with her 52-city speaking tour (in the U.S. and Canada) so that the winners can be models on stage while Sandy shares her techniques to the crowd of photographers attending her seminar. The Lubers lived in New Jersey at the time and as much as it pained Mia, they weren’t able to make it to the seminar in Maryland last year. They have since moved back to Maryland and are hopeful that their family wins for Maryland this year so that they have the opportunity to meet Sandy after all! Click here and you will go directly to the voting site. Once there, click on Tour City and scroll to “Baltimore”, then click on ‘Luber’. You will then have the opportunity of voting for their family. Each vote is $1, you can choose to cast any # of votes you’d like! We, and NILMDTS appreciate all of the votes and your consideration. Steve and Mia, thank you for entering this contest and bringing more awareness to NILMDTS. You know I love your family and always look forward to seeing you. Best of luck! Vote now! The National Model Search has begun! And there is only one week left to vote!!! 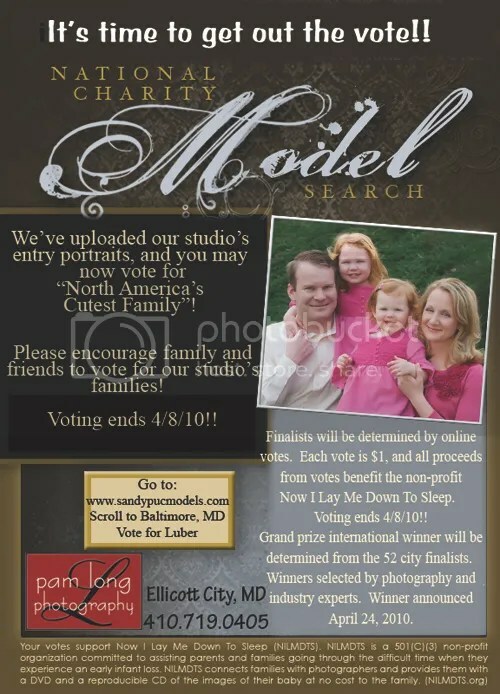 Some of my wonderful family clients are participating in the National Model Search for America’s Cutest Family. This contest raises money and awareness for Now I Lay Me Down To Sleep, a wonderful, charitable organization. Please feel free to click on the link to see why I became a volunteer for NILMDTS and why my studio and clients are participating in the contest. Cara and her sweet, cute baby girl are already on the the voting site. Cara’s baby is in my Baby’s First Year program, so I’ve had the pleasure of getting to know them these past several months. Cara is a tremendous make up artist and works for Up Do’s For I Do’s . I first met her when she was taking great care of one of my brides a couple of years ago. She has such a sweet, kind personality, you can’t help but want to be around her; truly enjoyable. Her sweetness has definitely passed on to her daughter; her smile lights up the room! Click here and you will go directly to the voting site. Once there, click on Tour City and scroll to “Baltimore”, then click on (Cara) Gibson. You will then have the option of voting for her family. Each vote is $1, you can choose to cast any # of votes you’d like! We, and NILMDTS appreciate all of the votes and your consideration. Thank you, Cara, for participating in this great contest. I know it’s not easy ‘putting yourself out there’. I appreciate you helping me bring awareness and donations to NILMDTS! Best of luck! 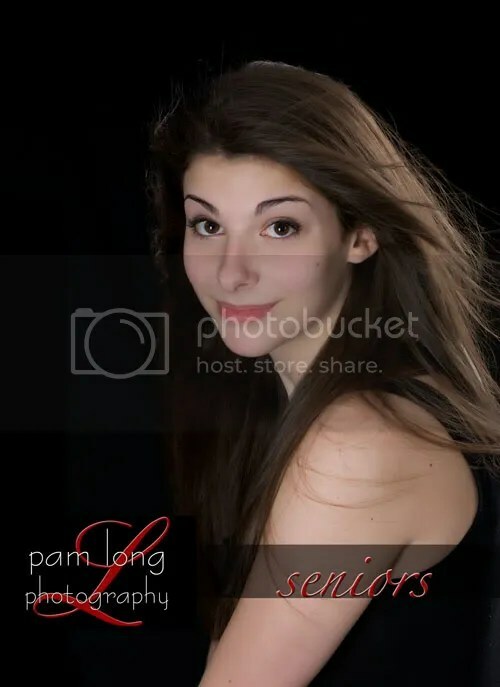 When I met with Rachel to discuss her senior portrait session, I knew we’d have a great time together. She was obviously a beautiful girl, but her inner beauty became more and more apparent as we spoke. We had a nice time chatting about her interests, her school day happenings and her family. This senior is also a very talented painter; we excitedly planned how to showcase her amazing ability to bring things to life through her paintings. She spoke highly of her grandmother, an accomplished painter….she proudly opened her phone to show me pictures. Rachel is very humble. As I was complimenting her as well as her talent, she continued bragging about the talent of her friends that share her art class with her. She has a lot of admiration for her peers. The day of her photo session was a lot of fun. We had to cancel her first session due to the blizzard and managed to squeeze her in before the second blizzard hit us. She was here the day the second storm started so we were pretty stoked to be able to get some snow shots for her. Here are just a few of my favorites from her session. Rachel, I have no doubt that you are going to be a huge success in whichever path you choose for your future. You’ve got a good head on your shoulders and I am proud to have been able to get to know you. Mary, I had a great time with you as well. The apple doesn’t fall far from the tree, that’s for sure! Thanks for investing your time and coming with Rachel to her sessions. You and your husband have done a wonderful job in raising your children. Thank you for the honor of documenting this very important time of your daughter’s life!